Floral Print Long Sleeved Swing Dress is rated 4.0 out of 5 by 9. 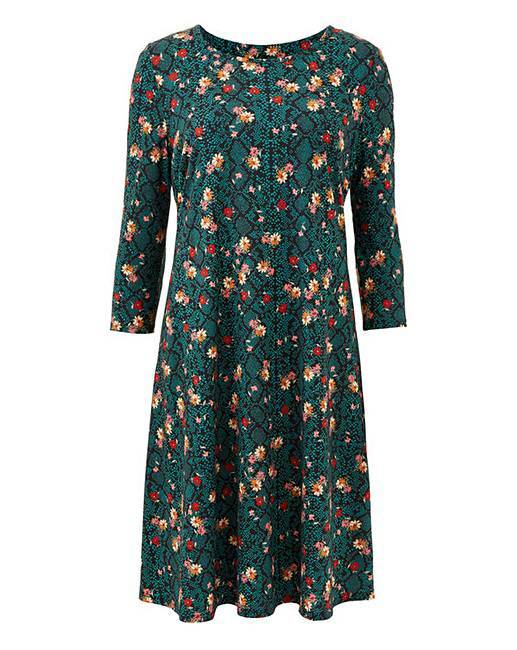 Update your spring wardrobe with the Floral Print Long-Sleeved Swing Dress. This gorgeous black dress is cut to a flattering swing shape featuring long sleeves and is made from a soft stretchy jersey fabric adorned in a beautiful green and pink floral print. Pair with some stylish ankle or knee-high boots to complete this effortlessly beautiful look. Rated 5 out of 5 by Rooo from Lovely fitting dress. Lovely style. Pretty design. Excellent value for money. Rated 4 out of 5 by lhb78 from Lovely dress Lovely dress hangs nicely, great length. Looks great with ankle boots for colder months and sandals or trainers in the warmer months. Rated 2 out of 5 by Jools57 from Very short Disappointing. Very short and tight, certainty no swing. Rated 5 out of 5 by cookie4 from Great colour, pattern and fabric I bought this last month and I love it as it is so comfy and a great fit. I love the colour and the pattern. The 3/4 sleeves are great as they keep you warm enough in spring/autumn. I have dressed this for an evening out and dressed for a day out, it's so versitile.